I purchased a container of gumballs for Davis’s gumball machine but he’d rather just have them straight from the container, so most of them haven’t made it into the machine. Thursday night, he asked for another gumball (he already had one in his mouth). Tracy retrieved the gumball container from the top of the refrigerator, opened it, and allowed Davis to reach in and grab his own gumball. Tracy sternly said to Davis to only take one, but alas, when given the option of reaching his own hand into that gumball container, Davis couldn’t resist, he just grabbed an undisclosed amount, as many as his little hand could hold. Tracy furrowed his brow and demanded that Davis put them back. Davis looked at his daddy, paused for a moment, and shoved the entire handful of gumballs into his mouth and began frantically chewing. When I asked how many gumballs he took, he held up a hand and managed to get out a colorfully droolly, “Five Mommy!” You can imagine how difficult it was not to laugh at this scene. But Tracy was very serious…Davis had been disobedient and he needed to be punished. 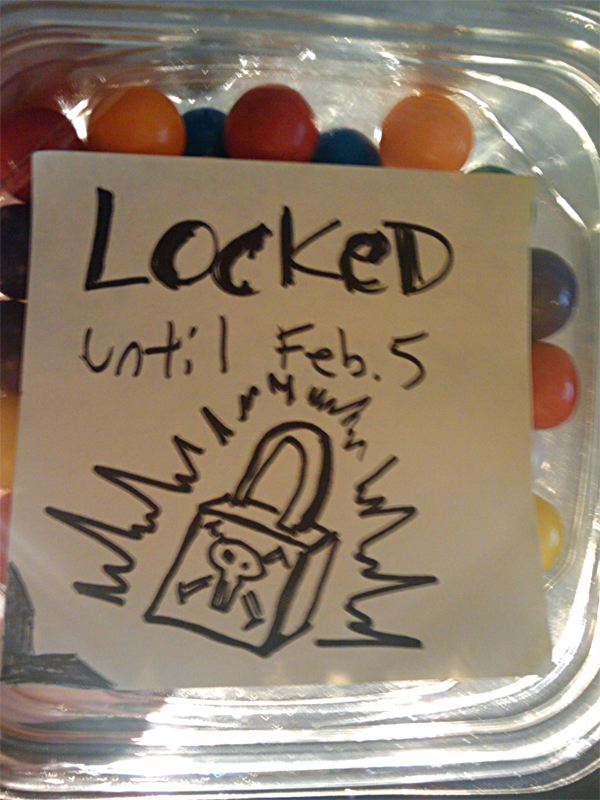 So now, the gumball container is sitting atop the refrigerator, safely out of reach, with a sticky note attached that reads, “LOCKED until February 5th!” Davis lost his gumball privileges for an entire week. I guess the punishment does fit the crime. However, yesterday Davis found a way around his gum restriction, he asked for a Blow Pop…and I gave it to him. It’s really not the same as gumballs. And, besides, it was, in a way, Tracy’s own fault that the child was able to shove his mouth full of gumballs. You just can’t give a three year old full reign with the gumball container. You have to keep control. You hold the container, ask what color, and then you as the adult determine the amount. Honestly, how many adults would be able to just take one, let alone a toddler being expected to practice that kind of restraint. And it SHALL REMAIN LOCKED until the time set forth hitherto. love the sign. tracy, i cannot believe you think a 3 yr old should have such self control.